Modern manufacturing can be logistically complex. Vendors and subcontractors are often in different countries and even on different continents, making it difficult for clients to oversee manufacturing processes. We inspect the items you ordered at their place of manufacture before delivery. Conducting such inspections is the most convenient and cost-effective way to ensure product quality and compliance with specifications. Our experts verify that the products, equipment, and installation elements you ordered comply with your expressed needs and expectations, but also with industry regulations, general specifications and other requirements. As an independent third-party, we support you with extensive inspection services during manufacturing and along the entire supply chain. This service ensures early detection of quality issues and allows mitigation prior to shipment. Request a quote now and find out how our vendor inspection services can benefit your project. We ensure that the manufacturing processes of your vendors and subcontractors are in compliance with industry standards and regulations. Additionally, we assess product quality, availability and supplier competence. 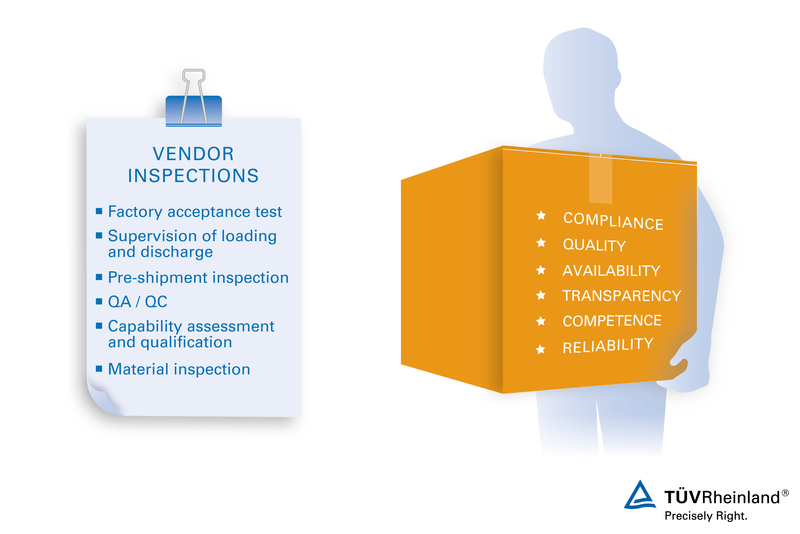 Our vendor inspection services increase transparency and ensure quality and compliance of the equipment and products you purchased, allowing you to avoid unnecessary costs. Our team of experts covers projects in over 60 countries and provides you with a knowledgeable partner able to assure the quality of industrial equipment, machinery, components, products and materials. Contact us and find out about how you can benefit from our worldwide presence to assess your existing and potential suppliers.